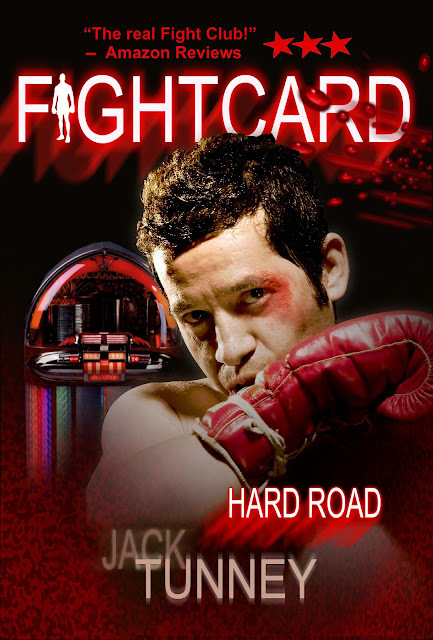 PAUL BISHOP ~ WRITER: P2K REVIEWS FIGHT CARD: HARD ROAD! P2K REVIEWS FIGHT CARD: HARD ROAD! DAVID FOSTER, SOON TO HAVE HIS OWN NOVELIST DEBUT WITH FIGHT CARD: KING OF THE OUTBACK, GIVES US THE LOWDOWN ON THE CURRENT FIGHT CARD ENTRY . . . FIGHT CARD: HARD ROAD . . .
. . . If you have been reading the Fight Card series (and I like to think you are), then you will have noticed that the first four books are set in 1954. I haven’t asked why this is, but I do have a theory – not a very good one, but it’s worth a shot. Here it is. On March 19, 1954, Joey Giardello knocked out Willie Tory at Madison Square Garden, in what was the first televised boxing prize fight to be shown in color. Boxing had long been popular, but imagine watching boxing on your television screen, in your own home – in colour. It was a whole new world! Boxing came alive. Hard Road is set three years later, in 1957. A lot had happened in those three years – chief among them was ‘Rock ‘n Roll’. Boxing now had colour and a beat, and author Kevin Michaels serves up a hard punching tale, set to a hip swiveling soundtrack . . .